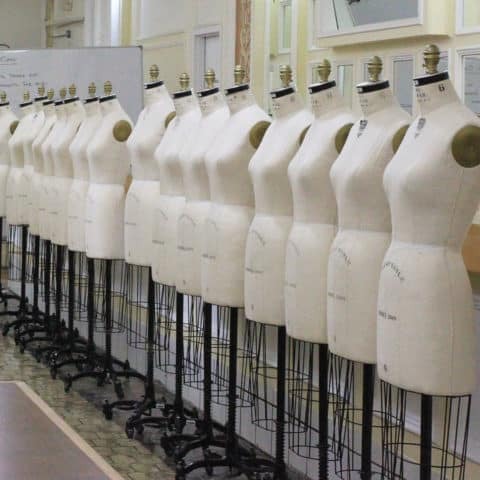 The Academy’s facilities are designed to prepare you for a career in fashion. Whether you’re interested in designing or running the business, our hands-on learning environment in our fully equipped fashion studio creates a culture that supports curiosity, investigation, and production. Online students are also hands-on, as they engage in discussions and activities through the online platform, social media, and real-time streaming of our events. Both online and onsite studio environments are equipped to give you the skills you need to create the fashion career of your dreams. In the 3D Pattern Making Lab students have access to cutting edge technology utilized by top brands in the industry. Gerber Accumark, YuniquePLM, CLO3D software and hardware such as a Gerber Infinity Plotter and Digitizer are available for bringing patterns to life, as done in the industry for global production. Learn the art of knitwear on production knitting machines for creating knit structures and garment styles for full fashion and cut & sew knits. Use our array of men’s and women’s dress forms, heat-transfer machines, and sawing and overlock machines to realize your vision. For fashion design students, take advantage of modern pattern-making systems, a fusing press, industrial and leather sewing machines, over 120 dress and sportswear forms, and a full complement of makeup and hairstyling equipment. Students check out several thousands of items per year from the School of Fashion’s Styling Closet for projects in their styling classes. It includes over 800 garments, accessories, and props so you will not need to buy or rent articles outside of school in order to complete your styling projects. New pieces are added to inventory each semester to ensure you are kept up with the latest trends. The Textile Labs are fully equipped for screen printing including over 700 silkscreens, repeat yardage tables, U.V. exposure units, pigments and dyes, and other industry standard equipment and tools.